﻿ Hotel CC Amsterdam. JIMAT di Agoda.com! 3 pengunjung membuat tempahan hari ini. Ada soalan mengenai Hotel CC? Sama ada anda melancong atau ke luar kawasan kerana kerja, Hotel CC merupakan pilihan penginapan hebat ketika melawat Amsterdam. Terletak 0.8 km dari keseronokan bandar, hotel 3-bintang ini terletak di lokasi yang sangat baik dan menyediakan akses kepada tarikan terbesar di bandar. Untuk pilihan bersiar-siar dan tempat daya tarikan tempatan, pelancong tidak perlu pergi jauh dari hotel kerana ianya berdekatan dengan Muzium Amstelkring, Bursa Saham Lama, Het Wapen van Riga (The Arms of Riga). Menawarkan tetamu hotel perkhidmatan yang unggul dan pelbagai kemudahan, Hotel CC komited untuk memastikan penginapan anda berada di tahap seberapa selesa yang mungkin. Kemudahan utama hotel termasuklah Wi-Fi percuma semua bilik, meja depan 24 jam, simpanan bagasi, Wi-Fi di tempat awam, bilik keluarga. Masuklah ke salah satu dari 81 bilik tetamu kami dan tenangkan hati anda dengan pelbagai kemudahan seperti televisyen skrin rata, penyaman udara, pemanas, panggilan kejut, meja yang boleh didapati di beberapa bilik terpilih. Sama ada anda peminat kecergasan atau hanya mencari cara untuk bersantai setelah seharian bekerja, anda akan dilayan oleh kemudahan rekreasi kelas tertinggi seperti taman. Apabila anda mencari penginapan yang selesa dan mudah di Amsterdam, ijadikan Hotel CC sebagai rumah anda seperti berada di rumah sebenar. berpuas hati senang nak ke tempat menarik di amsterdam .kehidupan malam yang menarik .tempahan awal amat di galakan. Great location but terrible sleeping box. Mid Morning check in. Staff was able to give us a room ready. Stayed here before therefore I could count on them to accommodate me after a long flight. Friendly helpful staff as always. Room was a bit small this time for two people but it had a view of the canal and Centraal. Quiet room and that's a big plus. A good location and lots of bars and restaurants close by, close to the red light district so the area is very popular with tourists. Rooms are smaller than average, however they do the job and are comfortable enough. Everything about this place is brilliant! From it’s walk distance to EVERYTHING you could ever need while visiting Amsterdam... to the friendly and courteous stuff every time you enter reception! I honestly can’t oversell this place! When arriving to Amsterdam we were a little early therefore we turned up to the hotel to actually keep our bags in storage. However, a member of staff behind the desk kindly allowed us for early check in as well arrived 3 hours before check in is actually available. We booked a 4 adult room which on the website shows 2 single beds and one double in a square shaped room. However we did not receive this room we received a room with one floor, stairs leading up to the bedroom where the 4 beds were but very cosy room, wasn't what we booked but it was very lovely and spacious for 4 people. The staff overall are so kind and great in general, the hotel itself is so lovely and the location is just incredible! I would definitely be coming back to this hotel as I enjoyed the stay very much. We were in Amsterdam only for two days, this hotel was perfect for that. Fantastic location, rooms with personality, clean. Hotel didn't offer any extra services - but actually we didnt need any. For example, there were plenty of cafes around for breakfast. 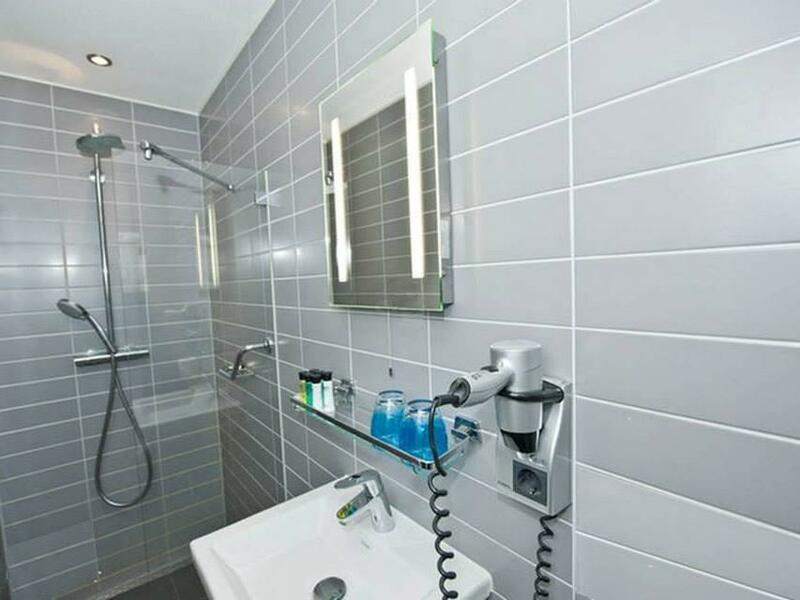 No Laundry Service , Small room shaped like triangle, other then that its a good location to check out the city much better then the Luxer near by for same price. Next time i will try air b n b though as the price for such is about the same. This is a quirky hotel in a great location, but what made the stay was how helpful the staff were. They knew that it was our first trip to Amsterdam, and gave us advice without condescension. They even gave me a bit of a room upgrade because it was my birthday week. I would stay here again. Stayed for 2 nights booked 2 rooms, on our 2nd night aircondition for both rooms did not work. Staff did not handle the situation very well, told us first to check panels inside our room then made us wait saying that someone will come check it. Instead of being able to rest early, we had to wait for someone to check the airconditioning. We then went down to reception and ask staff to come up with us to check, only to be told that the whole system for airconditiong went down. Staff could have just told us from the beginning that there was a problem with the main system instead of making us wait. Staff provided fan that does not work as well. As everyone has said, very small room. Great bathroom, best location. I was lucky to get this room as it was the last one on offer (didn't matter i had a booking months before) I was told to book directly with the Hotel to make sure i get the room I want with the bed I want. Staff were very helpful though and good breakfast is just a selection outside. Everything was pleasant here. Good location, clean hotel and toilet and friendly staff (most of them at least). Only disappointment was when I was speaking to this one staff on night duty on 15Aug. He was really rude when I was speaking with him, giving me one word replies and refused to look me in the eye and continued with whatever he was doing on his computer. Quite expensive for the size of the room However we had a really good stay, room clean and cosy and staff were very friendly and helpful. Good location too. 5 minute walk from central station. Would definitely stay here again. How nice the rooms were with the great view of the canal. How friendly and helpful the staff were. How central the hotel is to every attraction in Amsterdam. Booked a small double room here and requested a canal view, we stayed in room 217. The hotel is central to everything, only a minute walk to coffee shops, bars and red light district. The room was of a good size, it had a bathroom with a wet room style shower which was fantastic. The canal view was a massive plus and made the hotel stay so much better! Check in was so easy, we arrived at 10am and the room was ready so we could checked in early and dropped our bags off. Check out was also easy and we were allowed to keep our bags in storage till we had to leave for our flight. They had everything we needed, hair dryer, fast wifi and reception also had eu to uk plug adaptors which you could use by putting down a €5 euro deposit. It exceeded l expectations and this is by far the best hotel I have stayed in, previously visiting twice staying in different hotels. I will definitely be booking this hotel again when I return to Amsterdam. 5 min walk from Central station. 1 min to windows !!! , best if u want to stay in RLD, lot of food option around and party..........!!!! not comfortable if u have big luggage u may have to go up & down with satire to go to your room even after the elevator.